Day 1: After a long flight to Johnnesberg, including a long flight from Mumbai to Nairobi then hanging around in the small Kenyan airport for a few hours (the only entertainment was a small TV where we found out about the new pope), then back on another Air Kenya flight to take us down Jo'berg, finally arriving in O R Tambo airport at just gone midday. When we arrived in Jo'berg we collected our lugguage and immediately tried to continue with our quest to change money and draw out US Dollars to pay for our local payment. Apparently they refused to do it either, saying we needed an outbound ticket for them to even consider processing the change and as we wern't leaving that day we wern't eligable. Despite our annoyance and trying to reason with them that we needed the money to spend in S.Africa for our trip in a days time, we couldn't persuade them. I was pretty annoyed, and having been travelling for 20+ hours didn't help either. We walked around the airport trying to get change in Rand to call for our airport pickup (R150). We thought this would be best as we were both pretty nervous about arriving in Jo'berg having only heard bad things (including one women we met in China who was from Jo'berg who advised us just to steer well clear of it all together). We made the phone call and waited for the pickup outside the bustling airport. About 15 minutes later a chap in a normal looking car (not a taxi) turned up and helped us with our luggage into the car. Our hostel was call Lake View hostel and was only 10-15 minutes drive from the airport and quite a way out of town. There was a friendly young couple who ran the hostel which just looked like a converted home instead of a made-for-purpose hostel. It also turned out we were the only ones in a 4 bed dorm, so that was nice. Later in the afternoon we headed out with one of the hostel workers to the shops, he drove a short distance along the suburbian streets filled with fairly nice houses with fences with barbed wire, high metal gates, armed response signs and barred windows. Our driver said he'd grown up in Jo'berg and never had a problem, but the amount of security that every one of the houses had told a different story. 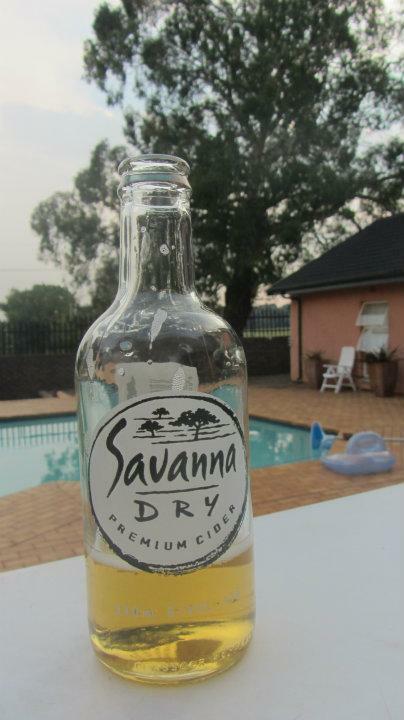 We stopped at the shop and bought some food for breakfast and dinner as well as a quick stop at the bottle shop to pick up some cheap Savanna ciders - S.Africa cider! Good times. When we got back to the hostel we phoned the Acacia people to ask if we could pay in Rand instead of dollars, explaining the problems we'd had. They were going to check and call us back to next day. The rest of the day was spend relaxing outside in the pool area with acouple of Savanna's. In the evening we opted to pay for the Ronel (one of the owners) to cook use a roast meal that evening. As it was only us and one other guest in the hostel we ended up eating alone, but that was fine by us. Day 2: After a great nights sleep and a long lay in we got up without any real plans for the day. We got a phone call from Acacia confirming that it'd be fine to pay in Rand, so we took a walk in the sun to the supermarket were wew cautiously took out as much money as we could for the local payment as well as some spending money for the trip. In the early evening we took a car ride over to the a nearby lodge called "MoAfrika" for our pre-departure meeting. It was fairly difficult to find, located down a dusty dirt road that didn't seem to lead anywhere only to have the lodge tucked round the corner just out of sight. After a little time hanging around looking at the parked up truck and playing with the family of large doberman-esque dogs. When we finally got round to the meeting, we had the opportunity to met some of the fellow group members as well as our guide, Zimbabwian "Justin". Not everyone was there, but our group seemed small and pleasant. We local payments and Justin explained how the trip was going to work, that instead of a solid 28 day trip, we'd be splitting it up into 2, the first 7 days with him then in Livingstone changing truck and group and heading back down to Cape Town. After the meeting we headed back to the hostel to pack and get the last nights sleep on a proper bed that we'd have in quite some time.